earthquake | Alaskan at Last! At 09:51 AKDT this (September 25th) morning a magnitude 6.24 earthquake occurred centered 60 miles WSW of Talkeetna at a depth of 62 miles; at that time I just happened to be in a warehouse in Palmer picking out the donated food I would be hauling back to Talkeetna. I was standing on the concrete loading dock when all the overhead doors that were down began to tremble as if being buffeted by a heavy wind. My fellow volunteers and members of the local food banks looked around in stunned silence; for the first 10 seconds no one knew what was happening but very quickly the more experienced folks said; “Earthquake”. About that same time a couple of the warehouse employees raced out doors and headed into the parking lot. About that same time I felt the heavy concrete floor began to rise and fall in a sine wave motion indicative of the event’s ‘S’ waves; by this time I was already moving to the closest open overhead door so I could stand in the doorway until the tremblor ceased. The entire event last a bit more than 30 seconds and was the most powerful earthquake I’ve yet to experience. In looking over the thickness of that loading dock floor it still boggles my mind that it can actually float and rise and fall in periodicity with the waves from the seismic event. It was a bit disconcerting to watch the faces of the folks with more than 20 years of living in Alaska; to a person there was some fear borne of the concern that this one might be ‘a big one’. From what I can determine this generally means anything at or above a magnitude 7.0 so in this case we were quite a bit short of that threshold. Still and all it was yet another amazing display of Nature’s power. When I arrived home after dropping off my food at the Pantry I discovered a number of items had been shifted around but no real damage. The event did cause the dual monitor set up on my main system to get knocked askew – no surprise as they are bolted to the wall – and pushed around some items on the desk but that was about the extent of any effects. The large CO2 tank I have in the utility room I use to carbonate a multitude of beverages was still standing just fine but then it is chained to the wall studs just in case something like this takes place. The dogs didn’t seem to be any worse for wear; as I wasn’t at home I didn’t have a chance to see if they showed any response before or during the event. Last November’s magnitude 5.4 just awoke Anana from a sound sleep but Qanuk was sleeping upstairs and while he did come running down to the main room I think that was from the effects of the event rather than some precognition. Alaska is the most seismically active of the 50 states and in just my thirteen months of living up here I’ve now experienced two events in excess of magnitude 5.3 and a number of smaller tremblors. Being a ‘flat lander’ from Michigan I’d experienced just a couple of very minor earthquakes growing up although while living around 70 miles ENE of Saint Louis I did awaken to a magnitude 4.6 event early one morning. This was the product of the notorious New Madrid fault line which uncorked a real doozey back in the early 1800’s – estimated to have been magnitude 7.1 to 8.0 – which caused the Mississippi River to reverse its flow for a few days. I’d experienced a number of relatively small events in the California Bay Area with most being between magnitude 4.0 and 5.0. My time in the Bay Area did teach me to seek out doorways in the event of a quake and stay away from windows. I guess the training did sink in as once I realized it was indeed an earthquake I immediately looked for a door way. Earthquakes are a part of life in Alaska and as such most folks just endure them and get on with life. I must admit to being fascinated when I can feel the earth shifting beneath my feet and experience other effects common to fairly powerful seismic events. But I’ve also seen imagery of the damage and destruction even a magnitude 6.4 earthquake can inflict so I am aware of the potential for serious issues from such occurrences. Being ready by knowing safety rules and taking the necessary precautions at home are really about all one can do in preparation for such events. I still must admit I am fascinated by the geology and physics involved in such events and especially of the incredible power of our Mother Earth! 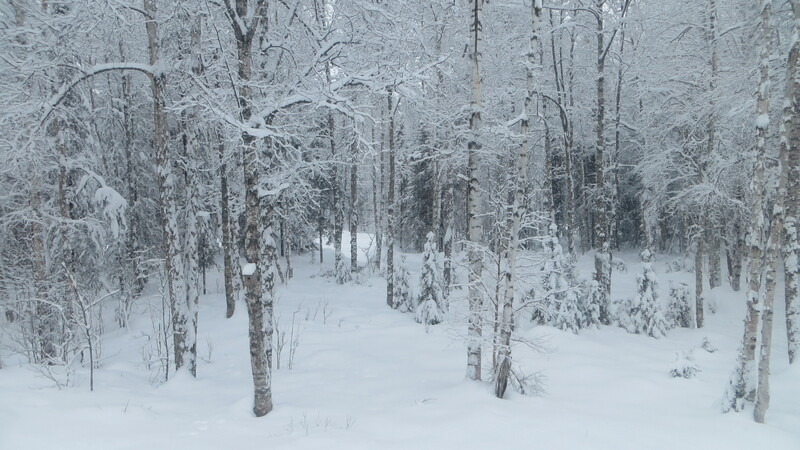 With this latest visit by winter we once again have in excess of two feet of snow pack although the bottom 11″ is mainly the icy remains of the earlier snow pack that melted in the record-setting warm January and was lashed by rain and freezing rain during that same month. Even with this snow event we are well below normal snow fall for the winter of 2013-2014 but everyone is most pleased to see the snow once again. Anana and Qanuk were a bit surprised by the snow depth when I let them outside this morning; the had largely tamped down the previous snow and ice and therefore had established some definite paths in the back yard. To suddenly find the snow up to their bellies once again was a shock but they quickly took advantage of the powder and commenced playing tag. I think they were just pleased to see more snow but then so was the entire local population. This afternoon I stopped by the KTNA studio after making the mail run into Talkeetna and spoke to a pair of folks who live around me; one didn’t notice the quake at all while the other definitely felt it and had the same recollection of the event as my own. I learned that the earthquakes up here often produce loud sounds in conjunction with the seismic activity. I also had it confirmed that a 4.4 is not a big deal; I guess they occur on an almost regular basis and most of the locals hardly notice them. I was told that 60 miles to the south in the Palmer-Wasilla area it’s even more common and the events are often larger. As stated earlier I knew Alaska was the most seismically active of the 50 states and even knew of the Denali fault line that runs right through this area but I was still surprised by the noise from the event and the fact that a 4.4 shook my house so ‘substantially’. Across the day I continued to find small items that had been knocked around from the earth’s perturbations. Once more I’m in awe of the amazing display of natural forces that just seems to be an everyday part of the Alaskan environment. Things are just a bit different up here in so many ways; just as 12+ inches of snow doesn’t shut down the local schools a magnitude 4.4 tremblor is no big deal. Heck, when the NWS did get their act together they issued a ‘Winter Weather Advisory’ for a snow event with the forecast total accumulation of 10″ to 20″ stating such an advisory meant only that travel might be ‘negatively impacted’. No wonder I just love living up here..!! !